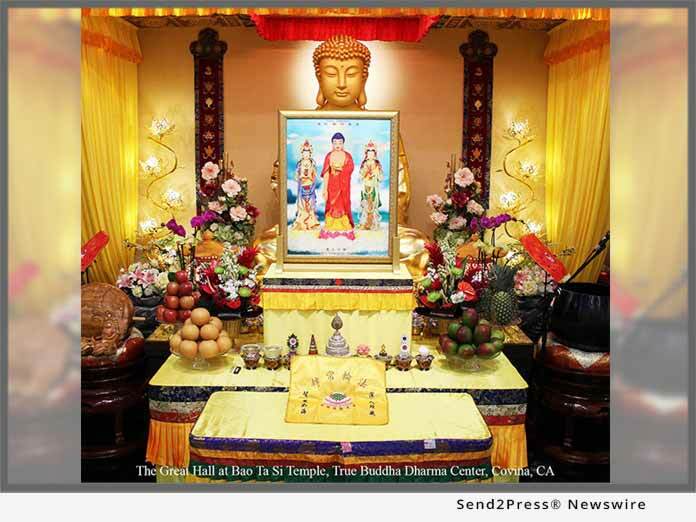 COVINA, Calif., Nov 30, 2018 (SEND2PRESS NEWSWIRE) -- Amitabha Buddha is the Lord of Buddhism of the Western World of the Utmost Bliss, says True Buddha Dharma Center. According to the "Amitabha Sutra Expounded by the Buddha," this Buddha emits light that is unmeasurable and has a life that is unmeasurable. It is for those reasons, He is called the Amitabha Buddha. We are happy that the holy birthday of Amitabha Buddha is upon us. The Boatasi Temple of Los Angeles, USA will initiate an Amitabha Buddha Dharma Assembly at 9 a.m., Sunday, December 23, 2018. At that time we will read sutras and keep mantras, provide food offerings in front of Buddhas, and pray to Amitabha Buddha to give blessings, protection, happiness, good health, longevity, and peacefulness to all living beings, who will increase their fortune and wisdom, be rid of calamities, and enjoy safety with their entire family. The merits from this dharma assembly shall be returned so that true Buddha-dharma will forever exist and flourish, people are blissful, our nation prosperous, and the world peaceful. We sincerely welcome all true believers to participate in this event enthusiastically so as to receive the benefits of Buddha-dharma and bask in the grace of Buddha, to practice for bliss and wisdom as well as to obtain peace and happiness in this lifetime, and consequently storing capital for being born in the Lotus World in the next lifetime! Bao Ta Si Temple address: 656 E. San Bernardino Rd, Covina, CA 91723. Walk-ins are welcome during open hours from 10 a.m. to 5 p.m., Mondays through Saturdays except holidays.